Alessi has such a great sense of fun throughout their entire kitchenware line, and this cute little tea strainer is no exception. 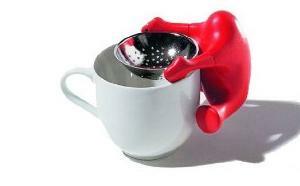 The Alessi Te O Tea Strainer is a hands-off tea strainer. Its design is that of a playfull little man (creature?) holding up a straining bowl; his hands do the work for you, so there is no need to burn your fingers trying to squeeze a hot tea bag. Simply drop your bag into the strainer and let it sit for a minute. I can’t really overstate the cuteness of this little guy. It would be a great gift for a tea lover, for just about any occasion.